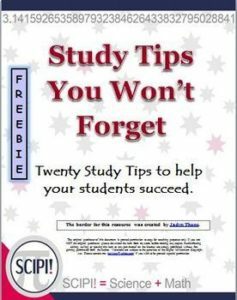 This resource lists 20 study skills intended to help students succeed in school. It is especially helpful for students taking math since math courses are unlike other courses. To pass most other subjects, a student must read, understand, and then recall the subject matter. However, to pass math, an extra step is required: a student must use the information they have learned to solve math problems correctly. This resource may be used as a journal topic, as a student guide, a goal setting starting point or copy it and make it into a poster for the classroom..
← Flexible Seating: Stools, rockers, rugs, and seats…For READING? ?